There are two important things I've learned about Wolfenstein: The New Order from watching this latest trailer. The first is that B.J. Blazkowicz wouldn't be a very good barista. The second, arguably more important lesson, is that Bethesda and developer MachineGames are proud enough of the writing, tone, and presentation of the game to dedicate a trailer to those attributes, instead of shooting mechanics. It's surprising only because first-person shooters, especially those that seem more ridiculous and dedicated to little else but action, use trailers to highlight explosions, guns, reprehensible violence, etc. Here we have a quiet, supposedly tense scene between B.J., two Nazi officers, and a giant robot. 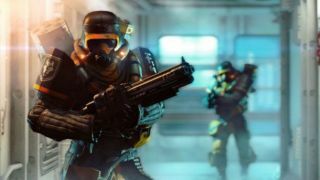 Reflecting on his recent hands-on time with Wolfenstein: The New Order , Chris recently made the astute observation that, so far, the game seems idiosyncratic. On the one hand, it embraces the inherent comedy of its exaggerated violence and the original game, which ended with you liquefying a robotic Hitler with bullets. On the other hand, it seems like it's also trying to take all that violence and war somewhat seriously. The game is clearly trying to evoke Quentin Tarantino in finding the balance between parody and earnestness, but also dialogue and pacing. It might be great in countless other ways, but I'm not sure this trailer proves that the game can pull that off.